I often find it helpful to hear about other moms’ mistakes to remind myself that no parent is perfect. Here’s a doozy to make you feel better about yourself: From age 8 – 12 weeks, my daughter slept on the stove. First, some disclaimers: the stove was not on. She was in her carseat so she couldn’t roll off (nor was she even able to roll at that age). She never got hurt and enjoyed some real power-naps up there. Unsurprisingly, the decision to put our precious newborn on the electric stovetop was made during the sleepless, desperate haze of the first three months. I’m sure you can imagine the scene. My husband and I were trying everything we could think of to make the over-tired baby go to sleep—bouncing, pacing, feeding, swaddling, changing—and nothing worked. Then, one of us hit the “vent fan” button above our stove. The loud white noise of the cooking fan knocked her instantly unconscious. Sweet relief. For the next few weeks, this was one of our favorite get-the-baby-to-nap tricks (she slept in her crib at night). On especially desperate days, there was a button called “vent fan boost” that we would push that really cranked up the noise. The cooking fan put all of our other white noise contraptions like the “Sleep Sheep” stuffed animal and the white noise app on my iPhone to shame. The risks seemed slim compared to the benefit of a long nap for the baby (and for me). But what if I had forgotten to check that all four burners were off? Or bumped into a dial with my hip as I walked away and turned a burner on? Or if she had woken up and wiggled so much that she and the bouncer all came tumbling down onto the cold, hard kitchen floor? She stopped napping up there after a few weeks because as she grew, she was getting too close to the fan and we didn’t want her to bump her head. Why, that would be unsafe! So yeah, I’m probably disqualified from any mythical “mother of the year” awards for the rest of my life. 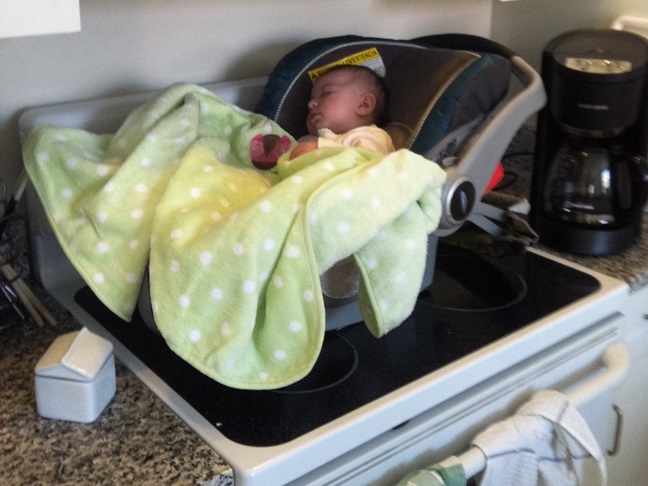 Our second daughter has yet to nap on top of the stove, but only because we’ve since moved and our new kitchen appliances aren’t as well set-up for infant sleep. But if we still lived in the condo? I wouldn’t put it past me. What’s your deepest, darkest mommy confession? 10 Parenting Hacks that Make Your Life Easier6 Smart Ideas for Snow Day Fun!